A cash business is a business that runs primarily on cash transactions. For example, restaurants take cash regularly, as do bars and other food establishments. Another type of cash business is the "casual" business, such as a flea market or farmer's market vendor. These businesses operate in areas where taking credit or debit cards is difficult (although many open-air market vendors do take cards). A cash business might also use cash to make payments, to vendors or to employees. There are benefits and drawbacks to accepting cash and paying in cash in a small business. Accepting cash and paying in cash is legal. Making cash transactions to avoid taxes is not legal. The IRS actively pursues businesses who underreport income and who pay in cash to avoid payroll taxes and other tax reports and payments. Can I Accept Payments in Cash? Many people don't carry a lot of cash with them. Younger shoppers in particular often carry no cash. You risk losing a sale if you don't accept their debit cards, even for a cup of coffee. Accepting cash means having cash on hand for making change, and having a lot of cash on hand can be a security risk. Be sure to make daily deposits if you have a lot of cash transactions each day. 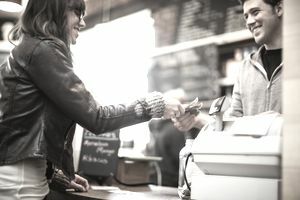 Allowing customers to pay with credit cards encourages them to buy more, increasing your profits, even if you have to pay card transaction fees. Large cash transactions over $10,000 for a single transaction or related transactions require reporting the transaction to the IRS. Use Form 8300 for this purpose. You don't have to worry about fraud, bounced or NSF checks or bogus credit/debit cards. No need to hassle with trying to get money from those people whose payments don't clear the bank. You don't have fees for card payments, which reduce your net profit on each transaction. These fees are particularly difficult when the transaction is small. Vendors at flea markets, craft fairs, farmers markets, street fairs, and art shows, and other outdoor and impermanent locations have traditionally accepted cash for transactions. But the advent of more portable point-of-sale (POS) machines has made it possible for even the most casual transaction to be conducted with a credit or debit card. Accepting cash in payment is becoming less necessary these days. If you do accept cash at one of these businesses, be sure to document all cash sales. According to Microbilt that a portion of Americans, particularly younger ones, are "unbanked" or "underbanked,". Offering these individuals the option of paying with cash will increase the likelihood of getting their ongoing business. Another alternative to credit/debit cards is new cash stations like "PayNearMe," which allows payment in cash at a nearby pay station. Every transaction in a business must be recorded, and all income, including cash income, must be reported to the IRS and taxes must be paid on that income. If your business accepts cash in payment for goods or services, you must have some way to record that cash payment. A voucher or cash receipt pad is one type of record you could use. You can find books of vouchers or cash receipt pad at your local office supply store. Keeping a record of cash payments you have made is a good thing. Being able to document more expense transactions increases your business expense deductions and lowers your business net income for tax purposes. These payments are business expenses and are deductible on your business tax return, but only if you have recorded them. Even small payments can be captured with a petty cash system. Paying employees or independent contractors in cash is not illegal, but payroll transactions, like others, must be recorded. It is illegal to fail to report and pay payroll taxes. And failing to report employee Social Security income deprives these workers of benefits at retirement. Read more about paying cash to employees and independent contractors. A major problem with cash businesses is reporting income to the IRS. A cash business that reports a loss for many years can fall under IRS audit scrutiny. The IRS uses industry averages and benchmarks to seek out businesses with income that falls below these averages. IRS audits focus on underreported income, and it is difficult to document a negative. How do you prove to the IRS that you did not take in cash in your business?. While there are some benefits for a small business to accept and pay cash, those cash transactions must be documented. In addition to the issues discussed above, selling a cash business can be difficult because the value of the customer base and of payables can't be measured. The information in this article and on this site is intended to be general and is not intended to be tax or legal advice. Nothing in this article should be assumed to advise business owners to evade taxes by accepting or paying in cash. Talk with your tax advisor before making any business decisions that can affect taxes or legal issues.